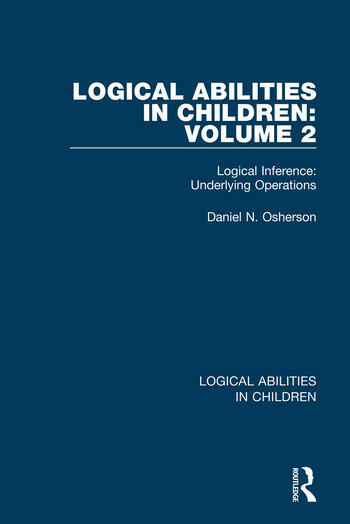 Originally published in 1974, the second volume of four (Logical Inference: Underlying Operations) provides a process-model for the solution of certain syllogistic reasoning problems. Testable predictions of the model are easily derived, and the available evidence supports the model’s description of the real-time mental steps mediating these logical abilities. A theory of development, connected to the model, makes these volumes all the more important for cognitive, developmental, and educational psychologists, as well as educators and linguists. Preface. 1. Introduction 2. Experiment I 3. Consistency 4. Standard Logic Algorithms as Psychological Models 5. A Theory of the Operations Underlying the Experimental Formulas 6. Performance Models and Prediction of Formula Difficulty 7. The Question of the Locus 8. Experiment II 9. Replication of Previous Analyses 10. Experiment III 11. Some Further Issues. References. Author Index. Subject Index.